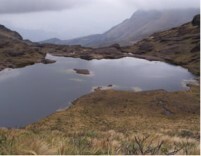 May 17, 2010 | Over the last two years, Nature and Culture International has made significant progress in helping to protect Peru’s paramos – unique alpine grassland ecosystems boasting unusually high numbers of endemic species. Due to the high altitude of paramos, species in this ecosystem have had to adapt to low atmospheric pressure, intense ultraviolet radiation, and the drying effects of Andean winds. So far, NCI has submitted the necessary technical documents for the recognition of the new Samanga 3,700 acre Private/Communal Conservation Area, which will protect 2,200 acres of forest and 1,500 acres of paramo. The community has already approved the plan, and we are currently working with the National Service of Protected Natural Areas (SERNANP) to attain official recognition. Additional funds have also been invested in the implementation of paramo management plans in the Samanga and Cachiaco communities. The Andean Paramos Project has invested $50,000 in the area, and NCI is currently managing a $100,000 budget as part of the Binational Catamayo Chira project, which seeks to protect the Catamayo Chira watershed, the source of water for thousands of Ecuadorians and Peruvians. Additionally in the region, we have completed a detailed map of the Peruvian paramos in Piura, Ayabaca and Pacaipampa, which will help with management activities in the area. And finally, we have recently helped to install monitoring equipment in the paramos of Pacaipampa that will monitor the effects of climate change as part of the international GLORIA (www.gloria.ac.at) Climate Change Program.